The updated Bajaj Dominar 400 is one of the most anticipated bikes waiting to be launched in the country. The new model has been spotted so many times and most of the details have been already leaked. Now the dealerships have started accepting bookings for the new Dominar 400 and the booking amount is Rs. 5000. The launch of updated Dominar 400 is expected to take place next month and the new model is likely to be priced slightly higher than outgoing version as it comes with lots more technologies along with premium features also. The overall design theme is similar to the current model in the market and the changes start with a new design for the front fender. The instrument cluster is completely new and it comes with features like distance to empty, average fuel efficiency, instantaneous fuel efficiency, service reminder, side stand indicator, engine-kill on switch indicator, speedometer, odometer, low oil pressure, coolant temperature, low battery, trip time and more. The second display on the fuel tank displays odometer, time and gear position indicator. One of the major updates for the new Dominar 400 is the introduction of upside-down forks as earlier the company offered telescopic forks to keep cost down. The engineers have also made some changes to the tuning of rear suspension to improve ride quality. 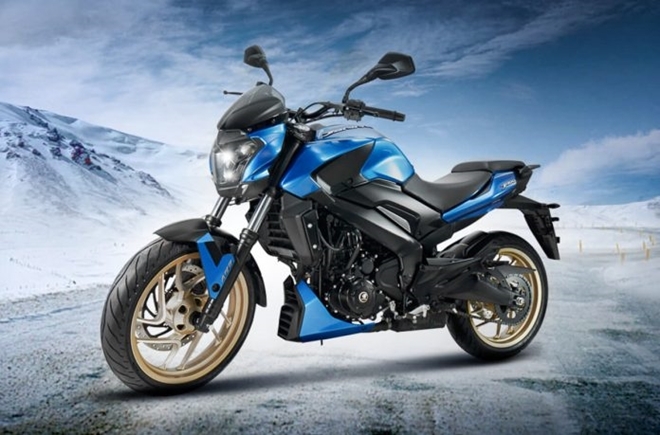 2019 Bajaj Dominar 400 retained the same 373.2 cc, single cylinder, liquid cooled, fuel injected engine but the power output has been increased to 39.9 bhp at 8,650 rpm from 35 PS at 8,000 rpm and the torque output is same 35 Nm but it now comes at slightly higher 7000 rpm. The bore and stroke remain unchanged. This engine is mated to a 6-speed gearbox and the Dominar 400 comes with slipper clutch also. These changes have increased the kerb weight by 2.5 kg and the new model tips the scale at 184.5 kg. The braking duties are handled by disc brakes at either end and the bike comes with dual-channel ABS system as standard.